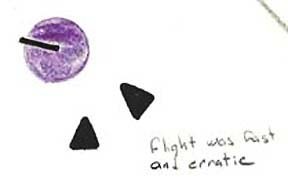 Joshua Rhinehall: “Flight was fast and erratic” between the huge sphere and the large, triangular craft that seemed to be in a dogfight. Illustration © 2011 by Joshua Rhinehall. April 14, 2014 Albuquerque, New Mexico - As the 1980s evolved into the 1990s and past New Year's Day 2000, my files filled up with contradictory descriptions of different types of non-humans and agendas ranging from positive entities trying to help humanity to negative — even dangerous — intents of insectoids, grey types, standing up reptiles and large, humanoid praying mantises.